Every day, more and more stores are opening up along the ecommerce horizon and this means more competition for your newly opened Pinnacle Cart store. One of the most popular online marketplaces, Amazon can offer significantly higher visibility to your store and help it make more sales. Our Pinnacle Cart Amazon integration is of the highest order, and ensures maximal sales for you. We use the best software management tools, such as our Pinnacle Cart Amazon app, in order to achieve the integration. Our services are designed to market your products across multiple channels and ensure the greatest online exposure. We can easily boost your product sales with the help of multi-channel promotional strategies of our marketing experts. We can also provide you with real-time inventory management or automated product listing services, in order to help you manage your single store or multiple stores based on the Pinnacle Cart platform. We can even provide you with shipping and order tracking management services in order to give you more benefits. We use our Pinnacle Cart Amazon connector to offer you product stock updates and look after various aspects of your business in order to make sure that you can make the most sales. Irrespective of your product size, colour, shape or type, we can offer you support. We can also assist you even if you have group products, bundles, kits or multi-variational products. We can sync your store products with the most appropriate item categories with the help of our granular level item category mappings. We can make varied pricing for different marketplaces, such as Amazon, with Pinnacle Cart Amazon extension. We also keep marked up costs for a variety of shopping engines. You can get 24/7 account tracking services, synchronizing of your product stock with that of Amazon and more. We make your Amazon product listings similar to the parent-child variation products in your Pinnacle Cart with the help of our Pinnacle Cart Amazon plugin. 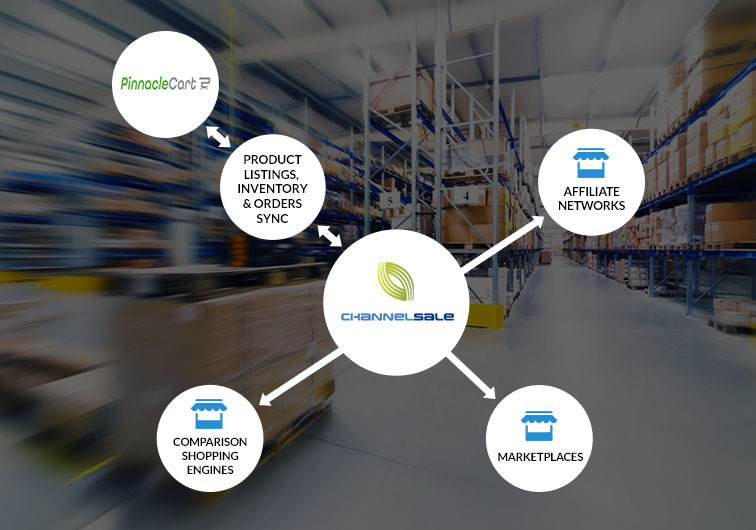 With ChannelSale, you can improve your sales greatly. Mail us at info@channelsale.com or call us on +1-866-709-9495 to get in touch with a Client Service Executive from our team.